Indeed, 'twas I. I have had about 6 over time, maybe more. At least 4 or 5 at one time. I would have to go back to the picture archive to be sure. Which is now going to markbass99! Really? I honestly thought you liked the HS, put I guess you like the H better? Me too! Good for markbass99, I hope he paid you good! Does it look a little bit like this one? Bongo 5 HS formerly owned by Strummer, who in turn bought it second hand from Biker4Him. Ok, I want to play. 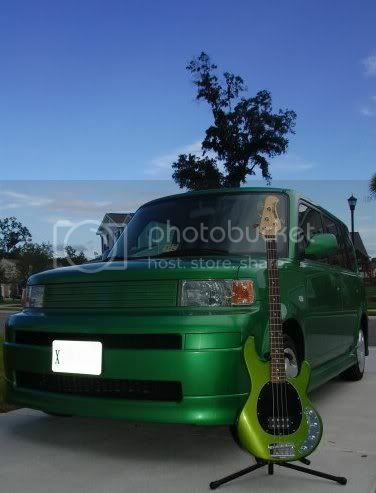 I'm the future owner of a DD I Bongo 5 HS, originally owned by Biker4Him, then Strummer, then Bovinehost. This is starting to look like a DD genealogy study. I don't think Jack ever met a Dargie he didn't like. As far as the price, that's up to Jack to disclose but lets just say that since I missed the order window for the original Dargie's the price has risen substantially. Which is appropriate since there were only 12 Bongo fivers made in the universe in this motif. And Jack doesn't accept American Express, but he does accept Bongo fiver(s) as legal tender. It does happen around here - look at Heinz! He's been everywhere, just like in the Johnny Cash song. Josh's Stingray was mine, then Brad's, now his. And THAT is a good Stingray! (Sold to fund dental surgery, how fun is THAT?) But I had no idea it was still here on the forum - that's cool. 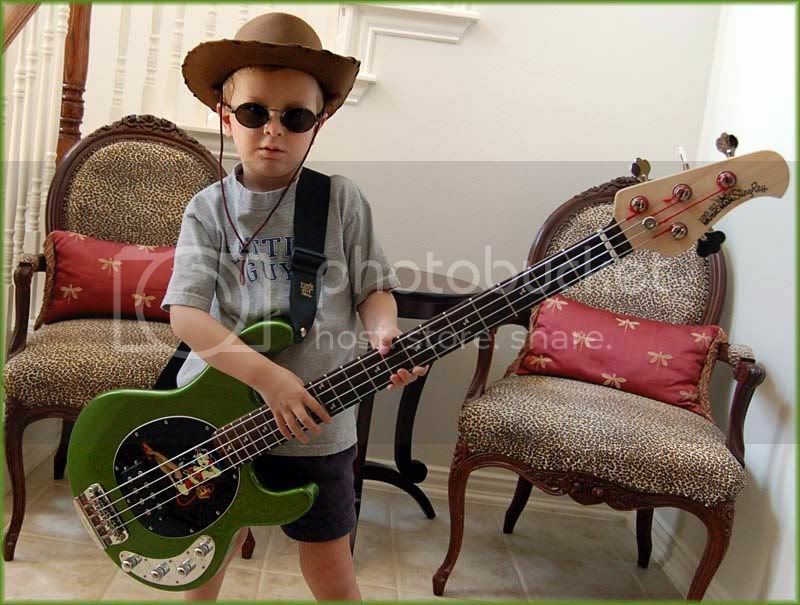 I also had a DD SR5 HH with matching headstock....can't remember where that one ended up. Jack doesn't accept American Express, but he does accept Bongo fiver(s) as legal tender. And as Mark knows, I was perfectly content with my 2 Bongos and was definitely not fishing for a deal or a trade or money or anything. I turned the poor boy down eight or ten times! But....well, I'll be owning a Dargie II and that's pretty cool, too. I had a Bongo 4HS (1 of only 5) that I sold earlier this year to Jim (gearhunter420). He may well be the current King of Dargies, I think he has 5 or 6 now. My daughter perfers the 30th Stingray to the Dargie. 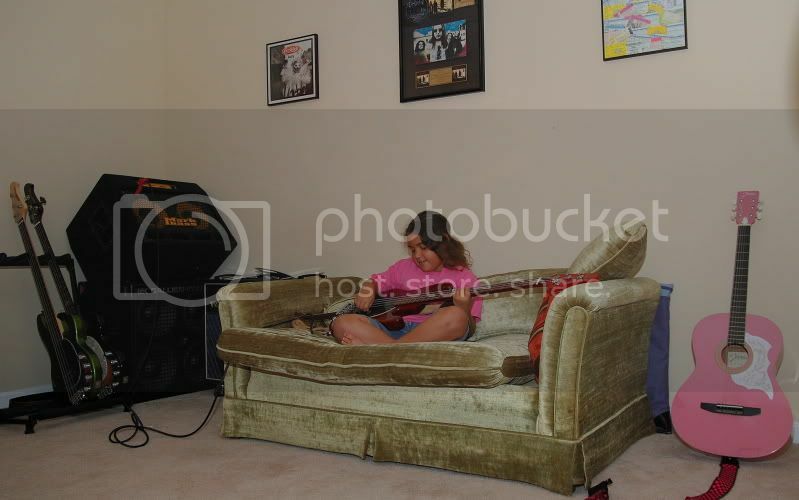 She is quite found of the dargie colored couch. And the wife likes the color so much she tried to get a matching car. Jack... are you the original owner of the Stingray? Last edited by mmbassplayer; 10-06-2009 at 05:33 PM. I am indeed. 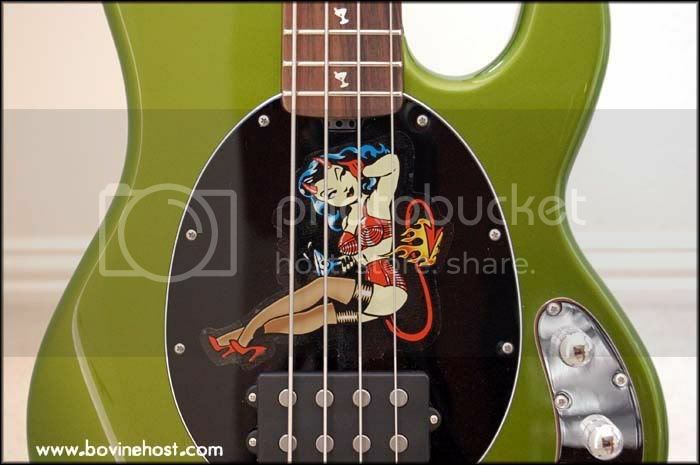 Wonder what happened to that pickguard - any idea? Aw, but zee devil woman, she is gone. And as Mark knows, I was perfectly content with my 2 Bongos and was definitely not fishing for a deal or a trade or money or anything. But....well, I'll be owning a Dargie II and that's pretty cool, too. There you go folks, you heard it here first, if anybody is deserving of a Dargie 2 and it's magical powers, it's Lord Bongo himself. It just took awhile to fine tune the mind control rays, Jack's brain had to be marinated slowly with the "just delivered" pictures of the color shifting paint and that gorgeous ebony. In the end Dargie Bongo osmosis will always equalize the pressure, two DD1's in one location and two DD2's in another location will eventually achieve balance, via UPS or Fedex. Jack's not losing a 5HS, he's gaining a 5HS that doesn't know what color it wants to be. I did also act temporarily as a stop over point for a DD1 Bongo 4HS Lined Fretless.... but she went to live in CO with OldManMusic shortly there after. And no... I'm pretty sure it wasn't "that" Bongo 4 LF either. I peeled the devil woman off before I sold the Ray, Jack. Sorry, it's my Amish upbringing. I still have my favorite EBMM bass, a Sterling 4HH Dargie that I bought new.